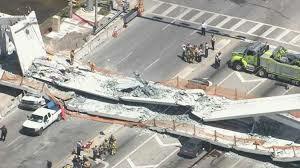 FLORIDA: A pedestrian bridge collapse at Florida International University (FIU) in Miami on Thursday killing several people as a result, according to a spokesman with the Florida Highway Patrol. The bridge, which weighed 950 tons and was 174 feet long, was scheduled to open early next year and was designed to withstand hurricane-force wind. It was just installed last Saturday with an estimated cost of $14.2 million and was funded as part of a $19.4 million grant from the US Department of Transportation.